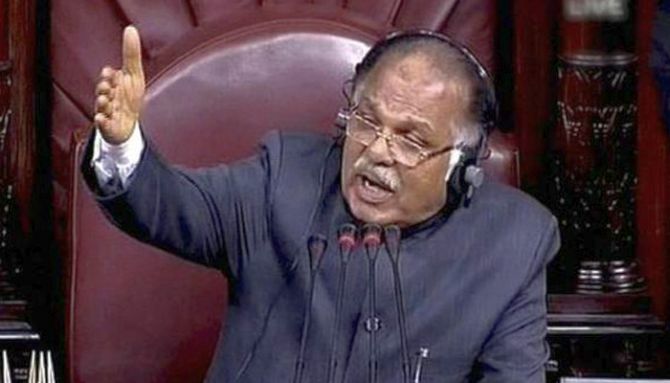 An angry Rajya Sabha Deputy Chairman P J Kurien on Wednesday pulled up Minister of State for Parliamentary Affairs Mukhtar Abbas Naqvi after the ruling side created uproar. At the same time, Kurien also grilled Congress leader Anand Sharma after he made an attempt to raise a Point of Order, which was rejected as the Chair was not convinced with the argument. At 2 pm, when the House reconvened after two adjournments due to opposition uproar, Kurien allowed Sharma to raise a Point of Order. He claimed that the Constitution had been violated. His attempt to raise the Point of Order was disturbed by shouting from the Treasury benches, which provoked Kurien who angrily made certain comments targeting Naqvi. The Deputy Chairman's comments were expunged later, marking a rare occurrence where the Chair's remarks have been deleted from the proceedings of the House. Naqvi said Bharatiya Janata Party members did not intend to cause any disturbance but wanted a debate on the issue as they were sad over the happenings in the House. Kurien then asked Sharma to specify which Article of the Constitution had been violated as claimed by him. "You say Constitution has been violated. Which Article has been violated," he kept asking Sharma. Sharma gave various arguments including the one that the monetory policy is the domain of the Reserve Bank of India and the prime minister had made a departure from the established Constitutional norms by making the announcement. As Kurien kept posing his question, the former Union minister was seen shuffling pages of the Constitution, saying he is looking for the Article. Sharma then said the prime minister had made the announcement on demonetisation on November 8 when summons for convening the Parliament had already been issued and so he should have made the announcement in Parliament. However, Kurien was not convinced and he rejected Sharma's Point of Order. Tiruchi Shiva of Dravida Munnetra Kazhagam also raised a Point of Order on the situation arising out of the note ban, which has impacted farmers. He also raised the issue of Modi's presence in the House during the discussion. Congress leader Pramod Tiwari also raised the Point of Order saying that Article 74 of the Constitution has been violated because the prime minister, as head of the government, had made the announcement in an address to the nation and so he should make a statement in the House as well. Kurien rejected this also, ruling that there is "no Point of Order". He asked Tiwarni not to make a political speech in the House. "I am not bothered about the politics of it," the Deputy Chairman said. After this, Kurien said that he would call the name of the member listed for speaking on the discussion and if the member does not stand, he will ask Minister of State for External Affairs M J Akbar to make a statement on the prime minister's visit to Japan on November 11-12. Congress members trooped into the Well and started raising slogans, "Pradhan Mantri bhago mat", PM sadan me aao" and "Narendra Modi bhago mat" (PM, don't run away. PM, come to the House and Narendra Modi, don;t run away). BJP members too rose from their seats and started raising slogans, which could not be heard due to the din. Akbar rose to read the statement but could not complete it due to the commotion. He then laid it on the table of the House. Kurien then adjourned the House for the day. Earlier, a comment by Naresh Agrawal of Samajwadi Party agitated BJP members, with newly-nominated member Roopa Ganguly taking the lead in protesting against the remarks. Kurien asked her to calm down and told Naqvi that he has not understood the issue as all the members are shouting and that only one should raise the issue.